James Coppinger pictured at Morecambe earlier in the season - where he made his 500th appearance for Doncaster Rovers. James Coppinger and Andy Butler have both been rewarded with new contracts. The duo, who have signed one-year contract extensions to keep them at the Keepmoat Stadium until the summer of 2018, have been influential in Doncaster Rovers’ rise to the top of League Two - on and off the pitch. Team captain Coppinger, Rovers’ all-time leading appearance maker, has scored eight times this season - his best ever return for Doncaster since joining from Exeter City in 2004. The evergreen 36-year-old is also among the country’s leading assist makers. Coppinger said: “I never thought I’d be here 13 years on, but I feel in really good condition. “I feel better than when I was younger, which sounds a little silly, but I am enjoying it and offering something to the team. “I’ve played 40 games a season for the past 16 years, and in pre-season I was as fit as anybody in the team, so it’s looking good for the next couple of years. Club captain Butler, 33, is an ever-present in League Two this term. 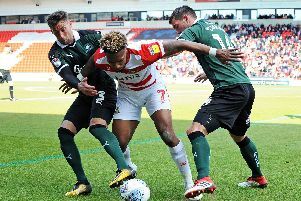 The Doncaster-born defender is a well respected figure in the dressing room and has also thrown himself into supporting the club off the field, including coaching the club’s under-12s team. “It’s great to be part of this club because it is going places now, everyone has bought into what the gaffer is trying to do,” said Butler.